Brexit and the rise of Donald Trump have signaled that anti-globalism sentiment is spreading amid weak economic recovery worldwide. Seconding this emotion are the long-suffering people of China who are being made to make new sacrifices as China prepares to host the G-20 Summit in early September. “For China, first and last it’s about the show, and to show they can organize a major international meeting,” said Matthew P. Goodman, a G-20 expert at the Center for Strategic and International Studies. Factories that produce chemicals, construction materials and textiles in four provinces have been forced to close to ensure blue skies for the visiting dignitaries. In order to assure a successful summit, China even agreed to a very rare summit with top diplomats from Japan and South Korea representing the strategic alliance with Beijing’s enemy, the United States. The new edition of Geostrategy-Direct reports that “hours before a historic trilateral meeting in Tokyo on Aug. 24, North Korea defiantly launched a submarine-based ballistic missile, undermining China’s credibility at the negotiation table. Observers say the conference in Hangzhou will be “the most significant gathering of world leaders in China’s history,” and Xi has bolstered security to ensure it goes smoothly. Xi’s authoritarian government is pulling out all the stops, “even forcing residents to move out of buildings near the meeting site to diminish the risk of protest or attacks and telling workers to take vacation to help clear the city and present a sanitized version of one of China’s most vibrant economic hubs,” a New York Times report said. The lengths Beijing is willing to go to when it has the spotlight includes banning Uighur chefs from a Shanghai restaurant. Uighurs are a Muslim minority that has been accused of fomenting terrorism, from working at one restaurant in the city. Some small businesses were asked to close in order to prevent any possible accidents occurred. The state-run Global Times reported that “one party official was detained for 10 days in July for complaining online about the high costs of the preparations” for the G-20. Many people vented their frustrations online, and calls to the city’s hotline mounted. “Every day our media attacks the vicious foreign powers, and now they come, we have to kneel and serve,” one person wrote. Xi’s government has instructed all Chinese to get with program. 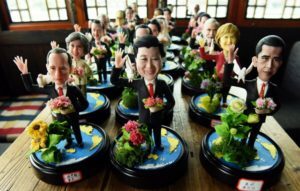 “People must not express their discontent with unreasonable actions or even deny the importance of the security work of the G-20 summit,” the state-run Zhejiang Daily wrote. While Beijing emphasizes the show, many believe there will be little actual geopolitical progress out of the G-20. “There will not be any policy miracles coming out of the summit,” said Tristram Sainsbury, project director of G-20 studies at the Lowy Institute for International Policy in Australia. Some, though, will continue to push globalization. “Globalization is nothing wrong. But we need to perfect it,” said Jack Ma, Alibaba founder & CEO. “We need to reduce all these protectionism measures, rolling back the old ones, and reducing all these kinds of small and regional trading agreements, which turn out to be complicated,” said Ning Gaoning, Sinochem chairman and B20 Trade & Investment Taskforce Chair.